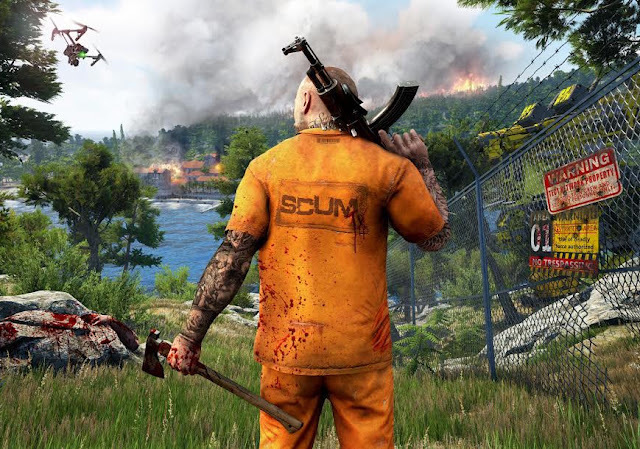 Here's a game production trio worthy of notice: popular grindhouse publisher, Devolver Digital has partnered with the team behind The Talos Principle and Serious Sam (Croteam), and developer, Gamepires, to announce a new survival game, SCUM. It's a topic we've seen handled in enough games in the past - Manhunt on the PlayStation 2 immediately springs to mind, but this game is far greater in scope than that one, of course. This is a multiplayer, open world survival game that promises an "unprecedented" level of character customisation and control. Also according to the press release: Players will balance base level needs with knowledge-based skills to manage everything from nourishment, metabolic rate, and body mass to weapons proficiency, combat style, and security systems hacking. Dominate the island with your skills, cunning, and strategies to achieve higher levels of game and receive powerful gifts from corporate sponsors and, if you happen to slip up and die, get resurrected by the show’s producers with all your valuable skills still intact. The game should be quite the looker, as it's being built in Unreal 4, and will be available via Early Access on PC next year.